According to a report in the Guardian, Apple is planning to revise the full-size iPad with LTE support for the United Kingdom, something that was missing when the device was released earlier this year. Additionally, the paper says the iPad mini will only support Wi-Fi. However, that claim seems slightly more suspect. This part leak of what is purported to be the rear shell of the iPad Mini includes both the plastic covering for a cellular antenna at the top of the device, as well as a SIM card slot on the lower right. The leaked part could be fake, but it appears to be well-machined and is more polished and detailed than a typical fake. Apple's expected "iPad mini" will only come in a Wi-Fi version – but there will also be a revised version of the iPad with 4G connectivity compatible with the UK's Everything Everywhere network, and sporting the new "Lightning" connector, industry sources have told the Guardian. Multiple sources contacted by the Guardian have indicated that they think the announcement of the "iPad mini" is imminent, with retail sources saying that they anticipate new products in November. The paper also links to photos posted by Australian writer Sonny Dickson that are purported to be photographs of the iPad mini, though the photos linked are mockups. The model number is from a current-generation Wi-Fi iPad, and it appears that the serial number is as well. There have been rumors of a full-size iPad refresh, potentially updating the device with better battery life or a Lightning connector, but the rumors of added LTE support for international markets is new. It makes sense, however, given the support for international LTE networks in the iPhone 5. I'll even buy one for my dog! Way to dump on everyone in the UK that just bought a new iPad, buying in to all of that "spectrum is fragmented, won't be available for a few years yet" jargon. here we go again, what with all the moaners on here. Yes I bought an ipad and yes I know it will be updated at some stage and mine wont be the latest, BUT does it still do everything it said it would do on the box when I bought it? YES!!!!! what difference if it gets updated sooner or later? will you ipad stop working? if its new you can always sell it at a good price. I'm still not sold on all this iPad Mini nonsense. and I dont even have a dog! Wifi only? Not sold on that one. IMO cellular makes more sense on a smaller device, something people are going to carry around more. Plus it would sort of fill the gap for a cellular-enabled iPod touch. Would a Wi-Fi only iPad Mini be completely ridiculous? Yes, of course. 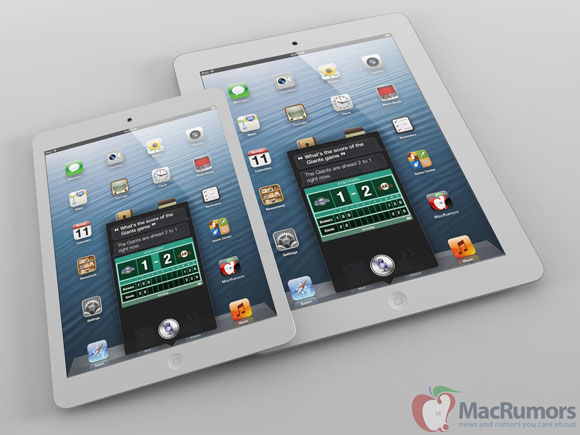 Would Apple actually release a Wi-Fi only iPad Mini? Yes, of course. Apple is king when it comes to getting customers to buy products following their refresh cycle. Releasing a Wi-Fi version now and then later releasing a 3G/4G version later would follow Apple's business model.